A racing game taking place in a futuristic world. The players control lightning-fast, cutting-edge vehicles. The title is the first multi-platform project from VD-dev, a seasoned French studio, known for games for Nintendo portable consoles. RISE: Race The Future for iOS, PC and etc. is a racing game featuring lightning-fast, futuristic vehicles. A French developer called VD-dev is responsible for the title. The development team has over 20 years of experience – their careers begun with designing titles for Amiga computers. However, throughout the years, the team has specialized in creating games for portable Nintendo consoles, such as Game Boy, Game Boy Advance, Nintendo DS, and Nintendo 3DS. The team has become popular in the developer circles because of technical proficiency and original 3D technology which got the most out of the platforms they’ve been working with. RISE: Race The Future is their first multiplatform project. RISE: Race The Future for iOS, PC and etc. employs an arcade driving model, where the main difficulty lies in mastering drift techniques. The classic Sega Rally series was one of the inspirations for the developers. The cars use a unique type of tires, allowing them to drive on any surface, even water. All the cars in the game were designed by Anthony Jannarelly, a professional designer, responsible for the extraordinary looks of cars such as Lykan Hypersport and Fenyr Supersport, produced by W Motors company. 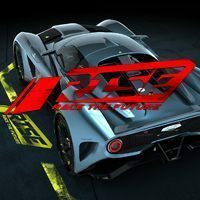 Aside from the multiplayer mode, and a run-of-the-mill arcade mode, in which we set the race parameters by ourselves, RISE: Race The Future includes a story campaign. It invites the player to learn the story of the fictional game world, and explains the origins and the purpose of the competitions in which we participate.